Do you need to be a 'Daredevil' to buy Netflix stock? This is shaping up to be a good week for Netflix. The company's annual shareholder meeting on Tuesday should be a pretty festive one. Netflix (NFLX) is up 85% this year and at an all-time high. What's not to like if you're a Netflix investor? And on Friday, one of Netflix's most popular and critically loved shows returns for its third season: "Orange is the New Black." Can the company keep the momentum going? Or are shares -- which now cost about $630 -- now so expensive that you have to be a "Daredevil" to buy them? I've written several stories about how absurd Netflix's valuation is. It's still crazy, trading at nearly 180 times 2016 earnings estimates. But Netflix has proven the critics wrong time and time again. Earlier this year, I wrote that Netflix needed more hits and that only two shows have really become mainstream successes: "Orange is the New Black" and the Kevin Spacey/Robin Wright political drama "House of Cards." Since then, Netflix has had three more hit shows debut: the Tina Fey-written comedy "Unbreakable Kimmy Schmidt," murder mystery "Bloodline" and the aforementioned Marvel action show "Daredevil." Netflix is no longer just about the White House and the Litchfield women's prison. And it looks like Netflix has even more big shows on the way -- particularly with Marvel. Neflix and Marvel owner Disney (DIS) announced in late 2013 that they were developing four shows based on Marvel characters -- "A.K.A. Jessica Jones," "Iron Fist" and "Luke Cage" are the other three, in addition to "Daredevil." A miniseries called "The Defenders" featuring all four title characters was planned as well. It seems likely that all of these shows will be popular with subscribers. Netflix has already renewed "Daredevil" for a second season as well. Netflix is also starting to produce movies as well. On Monday, it announced it was teaming with Brad Pitt's studio to make the satirical comedy "War Machine." The movie, which will star Pitt, will air in theaters and stream on Netflix next year. For now, it's hard to bet against Netflix. It truly is helping to revolutionize the media world. Netflix is now worth $38 billion. That's more than CBS (CBS), Viacom (VIAB) and Sony (SNE). It's made binge watching TV shows -- of both its original content as well as programs from other TV and cable networks -- a cultural phenomenon. The popularity of Netflix -- which costs much less than a monthly cable or satellite TV subscription -- is also a reason why networks like Showtime and HBO (which is owned by CNN parent company Time Warner (TWX)) have set up standalone streaming services that don't require a cable package. Netflix finished the first quarter with more than 62 million subscribers. Wall Street is forecasting that Netflix will top 74 million subscribers by the end of this year and have more than 91.5 million at the end of 2016. Much of the growth should come from international markets. Analysts are predicting international streaming revenue growth of more than 50% this year and next year. 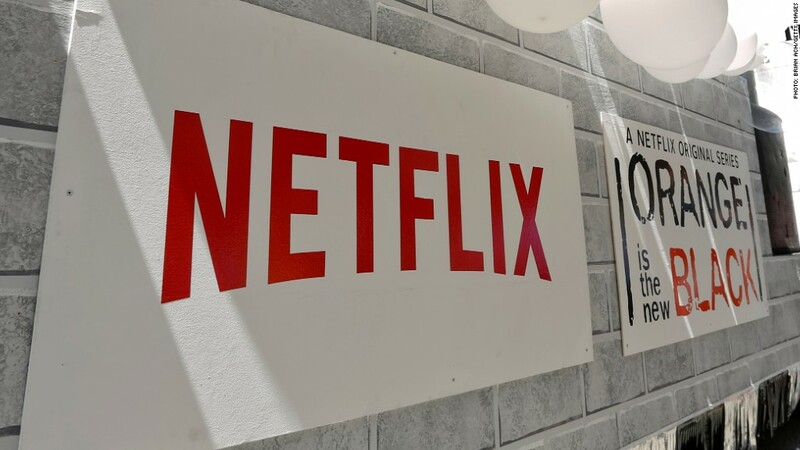 Netflix just announced plans to launch in Italy, Spain and Portugal in October. And analysts are expecting that Netfix's earnings will increase by an impressive 38% a year, on average, for the next few years. So Netflix is going to have to live up to these lofty expectations in order for the stock to keep climbing. It may stumble every now and then, as it has several times in the past few years. But all those hiccups have turned out to be merely temporary blips. CEO Reed Hastings deserves a lot of credit for building Netflix from a website that merely mailed you DVDs in red envelopes into what it is today. Netflix is, in many respects, a mirror image of Amazon (AMZN) -- which is also up sharply this year and not far from its all-time high. Neither stock is probably ever going to be cheap. And it just doesn't seem to matter for the momentum investors that love them.